After almost two hours, we had determined the “error” (or perhaps rather: the “difference”), created a proof for our customer that was “in line with expectations”, which he could use to determine the appropriate CMYK value in ISOCoatedV2, and solved the problem. 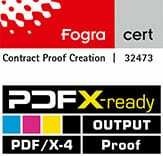 If we receive a PDF file containing RGB images, the next step is to check whether the file is a valid PDF/X-3 or PDF/X-4 file. If this is the case, and all input RGB profiles are correctly marked with color space (sRGB / AdobeRGB / ECI-RGB-V2 etc. ), then we check whether the correct output color space was used as output intent and whether CMYK data also contained the correct input profiles. If yes, then we proof the file with the settings: “Consider all input and output color spaces”. The data check has shown that RGB elements are contained in your data. RGB elements can only be safely interpreted in the proof if they are marked with a color profile and a rendering intent. This is the case, for example, with correct PDF/X-3 and PDF/X-4 data. The correct output intent must also be specified. At least one of these criteria does not seem to be the case for your file. The safest way would be to convert the contained RGB data to CMYK. This has the advantage that you have control over the conversion and can view the CMYK result again in Acrobat before uploading the file again for proofing. We can then reliably use your CMYK values for the proof. To do this, call up the current order in your customer account, delete the incorrect data and upload the corrected data. If, for example, the RGB element should only be a small image that is not relevant for the overall impression of the proof, or if you do not have another file available for the proof, we can of course also use your RGB data for the proof. If available, we then use your RGB source profiles and rendering intents, otherwise we use the sRGB standard and the rendering intent “relative colorimetric with depth compensation”, which in most cases will lead to correct proof results. If you would like us to proof the supplied RGB data in this way, please let us know. Please do not hesitate to contact us if you have any questions. Many greetings, your proofing team”. A customer called us, who sent open Adobe InDesign data in ISOCoatedV2 300% with RGB images to the production company for a sophisticated CD production on the advice of the producing company (“The print shop still has a prepress stage, which can then prepare your data perfectly…”). The result of the finished printed CD booklets and inlays did not correspond at all to the calibrated monitor image of our customer, so the client was very unhappy and requested the print data of the production company from the print shop responsible for the print to troubleshoot. Files in “US Web Coated” color space with 350% ink coverage came back from the printer. For troubleshooting, the customer then had a proof of his data created by us, but had selected the settings “Convert to target profile (retain values)” as usual when writing the proof PDF. We received data completely built up in CMYK, of which we produced a proof according to ISOCoatedV2 300% that fully met the expectations of our customer. Our error analysis revealed two weaknesses: On the one hand the open InDesign file of our customer with RGB images without embedded profiles, on the other hand the obviously wrong profile conversion of the print shop with InDesign CS2 to “US Web Coated”, a completely outdated profile never used in Europe, which was just delivered with CS2 and was probably never adapted due to lack of competence. A complaint in this case will of course be difficult, as on the one hand non-profiled RGB data was sent to the production company, and on the other hand no print PDF generated by the data producer in the correct output color space ISOCoatedV2 300% was supplied. If this had been done, one could at least have argued that the expected color of the production print would have been comprehensively known. With us, the case would also not have occurred in the proof, as we reject RGB data not provided with an ICC profile with the above mentioned error message, and do not convert them, as we cannot precisely predict how our customer would have liked to have the data converted. However, we are also happy to accept your individual requirements and circumstances. Give us a call or send us an email and describe your processing requirements which differ from those shown above. This entry was posted in Basics and tagged CMYK, CMYK profile, no profiles, profile mismatch, profiles, proofing profile, RGB by Matthias Betz. Bookmark the permalink.